Supplying Flexible Ducting in PVC, Silicone, Neoprene, Polyurethane (PU), Aluminium and Thermoplastic Rubber (TPR) for heating, ventilation, fume extraction, high temperature applications and conveying abrasive materials. Flextract PU4 – PU Ducting is a medium duty polyurethane ducting for conveying dust, wood shavings and other abrasives. 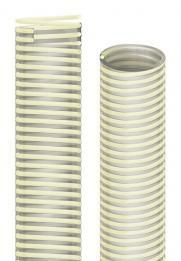 This flexible ducting hose has good chemical resistance and comes conveniently compressed for ease of shipping. A highly flexible tough PU ducting, ideal for the conveyance of abrasive materials such as sawdust, woodchips and granules. 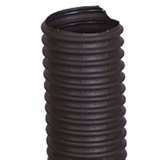 This is a Polyurethane Ducting made from a single-ply polyether, coated with a spring steel helix. A flexible ducting hose with good chemical resistance. This is a Flexible Grain Ducting suitable for conveying seeds, grain, animal feed, flour or tea. A high quality food grade PU Ducting with a smooth bore. A PU Ducting Hose manufactured from food grade polyurethane suitable for conveying flour, grain, granules and powders. Eolo PU Food Ducting has a smooth bore and a PVC external helix. Flexflyte Super is a highly flexible black TPR ducting made from a 2-ply wall of thermoplastic rubber reinforced with axial and helical yarns and supported by a thermoplastic coated steel spring helix. It has good oil and chemical resistance and excellent weathering and ageing properties. Ideal for air conveyance in harsh environments, fume removal & automotive air intake.